Childhood presentations of post-traumatic stress disorder (PTSD) can be difficult to identify and treat. Complete this program and learn cutting-edge strategies for children who present in your practice with symptoms of PTSD. You will learn interventions for both immediate post-trauma and long-term treatment. 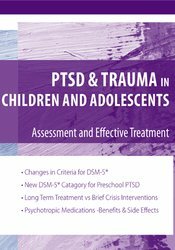 In the new DSM-5®, there is a new feature in the diagnosis of PTSD - a preschool subtype for children ages six and younger. You will learn the new criteria as this change will impact how you diagnose and treat children with PTSD. Discover why some children develop PTSD symptoms, while others do not - even after being exposed to the same traumatic event. You will learn what psychotropic medications are prescribed for PTSD in the pediatric population, along with benefits and side effects. Find out what you can do as a clinician to reduce your client’s symptoms and protect your client from future recurrences of PTSD. Multi-disc DVD recording (5 hours, 41 minutes) with electronic manual and instructions. Summarize major differences between childhood PTSD and adult PTSD. Identify treatments for PTSD in children, including specific cognitive-behavioral and play therapy interventions. Discuss the benefits of long-term treatment versus brief crisis interventions for pediatric PTSD. Identify psychotropic medications prescribed for pediatric PTSD. Relate the future directions of research on pediatric PTSD. Iowa Nurses: PESI, Inc. is an approved provider by the Iowa Board of Nursing. Provider #: 346. Nurses successfully completing these self-study materials will earn 7.4 self-study contact hours. Florida Occupational Therapists & Occupational Therapy Assistant: PESI, Inc. is an approved provider with the Florida Board of Occupational Therapy. Provider Number 50-399. This self-study course qualifies for 6.1 continuing education credits. Florida Board of Psychology: PESI, Inc., is an approved provider with the Florida Board of Psychology. Provider Number 50-399. This product qualifies for 6.1 self-study continuing education credits. Please make sure to bring your license number to the seminar so that we can report your attendance to CE Brokers.